But first, let’s talk about security and diversification. On Sunday, December 13, Turkmenistan is scheduled to break ground on the much-discussed Turkmenistan-Afghanistan-Pakistan-India (TAPI) pipeline. The 1,735-kilometer pipeline is supposed to eventually carry 33 billion cubic meters of gas per year to South Asia from Turkmenistan. Price estimates range as high as $10 billion and the latest date for completion is an optimistic 2018. But as the groundbreaking approaches, it’s prudent to discuss how TAPI is the lightest form of economic diversification and how security, often mentioned but not always explained, is the greatest threat to the project’s completion. First, let’s discuss diversification. Turkmenistan’s economy is entirely wrapped up in the energy trade, mostly in selling natural gas to China. Diversification is a necessity to mitigate the risks associated with being entirely dependent not just on one trade but one buyer. Of course, TAPI is one kind of diversification. Expanding Turkmenistan’s pool of customers is a good thing, but of limited utility give the dip in hydrocarbon prices and the expectation that lower prices will persist. Turkmenistan may pipe more natural gas to more countries but it won’t be making much more money. Deeper diversification of the Turkmen economy is needed. There have been semi-steps — such as projects to convert natural gas into high-tech goods like plastics. The Japanese have stepped in as a partner on some such projects, as have the Turks. But even here, the investment climate is poor precisely because Turkmenistan is essentially a closed state. Turkmenistan assumed the role of consortium leader (taking a 51 percent stake) for the TAPI project, after several Western firms withdrew interest on the grounds that Ashgabat would not allow them an equity stake in the project. Turkmenistan’s reluctance to grant foreign firms such stakes in its fields has precluded their investment in the country. As Micha’el Tanchum wrote recently for The Diplomat, current talk points to the Dubai-based oil and gas company Dragon Oil as being close to finalizing its investment in the TAPI project. But even if the consortium can be filled out and partners founded, regional security concerns could endlessly delay and derail the completion of the project. Often (and I am also a culprit of this) we tend to mention security as a risk and move on, as if it is a minor concern. Even when security is characterized as a major concern, it’s not worth explaining. 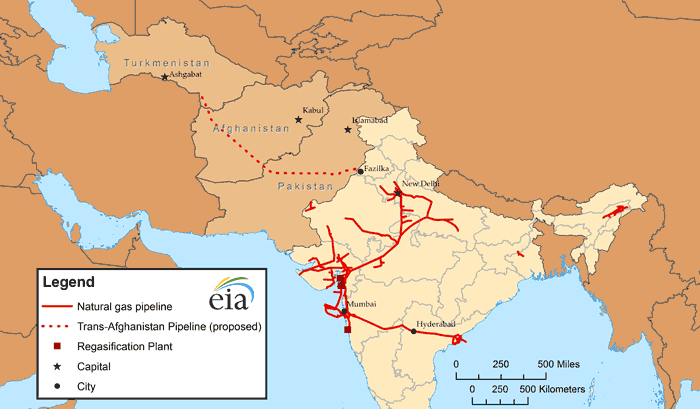 But let’s pause and parse through the pipeline’s route more deeply to see why security is the overarching problem with TAPI (referred to by the U.S. Energy Information Administration as the Trans-Afghanistan pipeline in the map below). Representation of international boundaries and names is not necessarily authoritative. 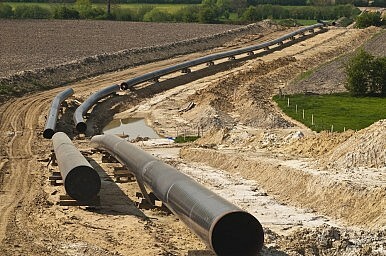 The gas for the pipeline is to be sourced from the massive Galkynysh field in southeastern Turkmenistan. The pipeline is to run across the border into Afghanistan’s Herat province, and then traverse southeast through Farah and Helmand provinces following the Herat-Kandahar highway and enter Kandahar province. At the Pakistani border, the pipeline will enter Balochistan near the provincial capital of Quetta and route due east until it enters India and ends in the town of Fazilka. This route could shift, but there are only so many ways to get from Turkmenistan to India. Afghanistan poses the biggest, though not the only, security challenge. In Herat this week, TOLOnews reported that fighting between Taliban factions has driven people from their homes. In October, Taliban overran the district through which the Herat-Kandahar highway runs in Farah province (though the Afghan government denied it). Helmand has seen heavy fighting in the last year. In October, the Taliban put pressure on Lashkar Gah, the provincial capital (through which the highway runs), and today it was reported that the Taliban have seized control of Khan Neshin, in the province’s south. In Kandahar, the Taliban attacked the international airport on Tuesday, killing 37 people and injuring 35 more. This isn’t to say that over the life of the TAPI project, the security situation in Afghanistan won’t stabilize. But if recent history serves as a preview, there is little room to hope for vast improvements. The Afghans have reportedly said they’ll provide security for the pipeline, but all it takes is one successful explosion to damage completed sections worth millions. Attacks by the Taliban or other militants could harry the project for years, not to mention scare investors and workers away. At the very least, security will delay the project’s completion and drive up its price tag — at the worst, TAPI will be abandoned after billions in sunk costs. Turkmenistan’s President Gurbanguly Berdimuhamedov will host representatives from Afghanistan, Pakistan, and India for the groundbreaking this weekend. Afghan President Ashraf Ghani accepted an invitation to attend. There are sure to be smiles all around and talk of rosy futures. But the cynics among us won’t be holding our breath.